It comes as no surprise that Congress’ $1.3 trillion dollar omnibus budget package is rubbing raw the already thin patience of the Republican base. Rather than draining the swamp, which includes seizing this historic moment of Republican control of both Congress and the White House to dramatically cut government spending, Congress instead (with the support of the White House) is spending as recklessly as when Democrats were in charge. Couple this with scant legislative victories outside of President Donald Trump’s tax cuts, especially in regards to expanding gun rights, Republicans are doing little – literally – to motivate voters to show up in November, and keep them in power. That is why killing the United Nation’s Arms Trade Treaty (ATT) is precisely the low-hanging fruit Republicans need to score a quick and much needed victory with conservatives. And, just as Senate Majority Leader Mitch McConnell prefers it, doing so would require virtually no effort on his part. In September 2013, the Obama administration signed the UN-ATT, an international agreement that regulates the sale, transfer and export of conventional weapons, including “small arms and light weapons”; essentially every civilian firearm on the market. And, just as gun control activists in the United States claim their “common sense” demands are aimed at reducing “human suffering” attributed to firearms, the U.N. purports the ATT to be necessary for combatting the international trade of illicit firearms. Nevertheless, as we all know to be true, these claims are nothing more than emotionally-driven and thinly-veiled attempts to undermine gun rights; both here in the United States, and abroad in member countries. 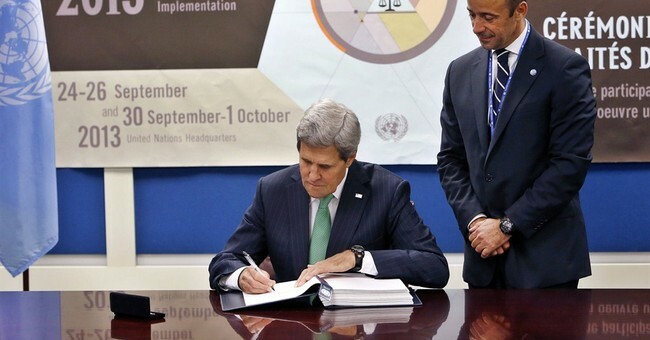 Though the treaty was officially signed by then-Secretary of State John Kerry more than four years ago, it has languished in the Senate without ratification. Even still, the treaty poses a real danger to gun rights. As a signatory, the United States is obligated not to act “contrary to” the ATT’s terms – even if those actions conflict with the interests and constitutional rights of U.S. citizens. This obligation exists, and continues to exist, regardless of whether the Senate ever gets around to ratifying it. Of course, that may change if Democrats regain control of the Senate, and the White House. Their reticence on the treaty’s presence is by no means indication they have forgotten about this crucial power play to limit gun rights; especially in today’s domestic political climate in which even some Republicans are now caving to pressure from gun control activists. They are simply biding their time. Additionally, the very existence of the signed ATT is an excuse and policy vehicle for career bureaucrats, like those at the Bureau of Alcohol, Tobacco, and Firearms, to use their regulatory authority to weaken gun rights under the guise of ATT compulsion. There is historical precedence for Trump to “un-sign” the treaty; in 2002, former United States Ambassador to the United Nations John Bolton sent a letter to the U.N. formally rescinding America’s involvement with the Rome Statute of the International Criminal Court, which had been signed by President Clinton two years before but never ratified by the Senate. However, officially removing U.S. support for the ATT would be more significant (and less controversial) were it to come from the Senate. And, all it would take is a document McConnell would transmit to the Senate. Easy as pie. Yet, in spite of the modest effort it would take in defeating the ATT once and for all, doing so would be a huge shot across the bow of gun-grabbers in the U.S. and in the United Nations community that despite the anti-gun chatter of the last few weeks, the United States will not be party to international schemes to rid citizens of their God-given right to self-defense. Moreover, it would be a meaningful and much needed sign to conservatives that Republicans in Congress have not completely abandoned them, even as other promises such as the Hearing Protection Act and national reciprocity for concealed carry are still noticeably unfulfilled. The recent special elections Republicans have lost in Alabama and Pennsylvania are about more than just bad candidates; they are a sign that Democrats are foaming at the mouth to get back into power, and are incredibly motivated at the ballot box to do so. So far, Republicans in Congress have done almost nothing to motivate conservatives to respond in kind. Killing the ATT would be at least some red meat to throw down to voters, while finally taking the ATT out of limbo and eliminating a vulnerability to gun rights that should have been handled months ago. If McConnell has any inkling of leadership left in him, the ATT will be slated for destruction by the month’s end.